James Turk: I'm James Turk. I'm a director of the GoldMoney Foundation. I'm here with one of the legends of Wall Street, Victor Sperandeo or Trader Vic as he's known popularly among the traders of Wall Street. Vic, it's a pleasure to be with you here today. Victor is the CEO of Alpha Financial Technologies. I'd like to start a little bit by talking about the markets, where we're going. I know you have some really clear, strong views on the outlook for the dollar. Victor Sperandeo: This is an obvious trend. If you look at what's happened in the last two and a half years, let's call it, and every problem after Lehman Brothers has been solved across the world with borrowing and printing, debasing currencies and keeping interest rates low. That trend by Great Britain, Japan, the eurozone, and the United States basically is going to continue. So you have to conclude, and this is unquestionable – there is no other answer that you're headed towards an inflationary environment because that's the way these countries, first of all, have solved their problems. Whether they want to or not and that's what some countries like the US and Ben Bernanke want to do with this country is solve their problems by inflating away the debt among other things. The value of the dollar, the dollar has to go down in the long run. And inflation has to be what happens in the future. James: So it's print, print, print, what they call quantitative using is really just money printing. James: A couple years ago, I can't remember exactly when it was, we ran into each other at a conference in New York and the gold price was much, much lower than it is today. You said to me that buying gold was probably one of the simplest trades you've ever seen in your entire life. Is buying gold still your favourite trade? Victor: What I said was I couldn't figure any scenario where it could go down. But that was a little lower level. Here, I also believe that, that gold can only go up unless things change. Now if things change, gold may change. I just don't see any reason for any change that any government is promoting that would make gold go down. 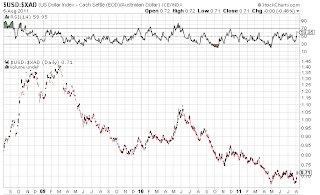 Now the only difference is because we live in a very leveraged environment in the commodity world, 10 per cent, five per cent margins. Locals, or the people who trade on the floors, or professionals, use a lot of leverage because they look to get rich in a week, rich in a generic sense. So the key is when things change, the gold and silver markets, especially those two, will be extremely volatile, silver far more than gold. James: That's what we're presently seeing. Victor: That's what you're presently seeing. But the key is it's unquestionable that you have to have a percentage of your portfolio. Now, this may differ 10 per cent, five per cent if you're an institution maybe, maybe as much as 20 per cent if you're a hedge fund in gold as, if you will, an insurance policy, a hedge. Basically it's been in an uptrend for 10 years. There's no reason to see it change. So gold is still a buy. The only difference is that really you should by it when it sells off like now. Don't buy gold in an uptrend where it's moved up 10 days in a row or five days in a row, et cetera. On weakness it's still a great trade and a great investment actually. James: But even if you buy it on a temporary peak in a bull market, eventually the bull market is going to bail you out because the long term trend is going to take the price much higher over the next several years. James: I was looking for the bargain. Victor: Anything in weakness because the public, and I don't know who I'm talking to here, but the public gets very upset if they buy something and it loses five per cent in a week. Gold last week was 4.2 per cent, nothing in my world. But the point is most people get scared. So to try to get them into a good entry point they should maybe buy in weakness, like now. Gold is sold off. It's been temporary now with a small, minor correction, I would call it. So this is a good time. James: The $1,500 area looks pretty solid to you, then, in other words, in terms of a buying opportunity for gold? Victor: Absolutely. Still, as long as nothing changes gold is going to appreciate. James: When you say "nothing changes" you basically are saying "nothing in Washington changes." In other words, if we continue down this road of spending and spending and borrowing and borrowing, that's going to debase the dollar and gold is going to go up in dollar terms as a consequence. James: You don't see anything happening in Washington to suggest it is going to change? Victor: This is the Hatfields and McCoys. You've got the Republicans in the Tea Party swinging the votes. You've got, effectively, socialists/Marxists on the other side. So how the twain will meet, I don't know, but certainly until 2012 election it's not going to change. James: Are we going to make it to 2012? In other words, they're talking about a $2 trillion increase in the national debt, in August, to buy time to put more debt on until 2012. So it's obviously not political will today. They're just kicking the can down the road. Is that going to be a wake-up call for the market that enough is enough? Victor: Well, it wouldn't be that easy because the Republicans want cuts in spending of some sort. They are asking for the equivalent. So you have to see how that plays out. But let's just say the essence of the short term of 2012; I believe the markets will probably make it because you'll probably get a QE3. By the way, Bernanke is clearly said in the minutes of the Fed, the August 27 minutes, that he leaves open anything he wants to do. He can adjust the portfolio is what it says. But the key is that what happens to – there are two items that are going to create whether we make it past the election. Number one is the US economy and the world economy going to go into a major double dip. If that occurs and therefore the debt gets structured to go way up in terms of the forecast because GDP is going way down. So GDP gets called to go into a recession again. 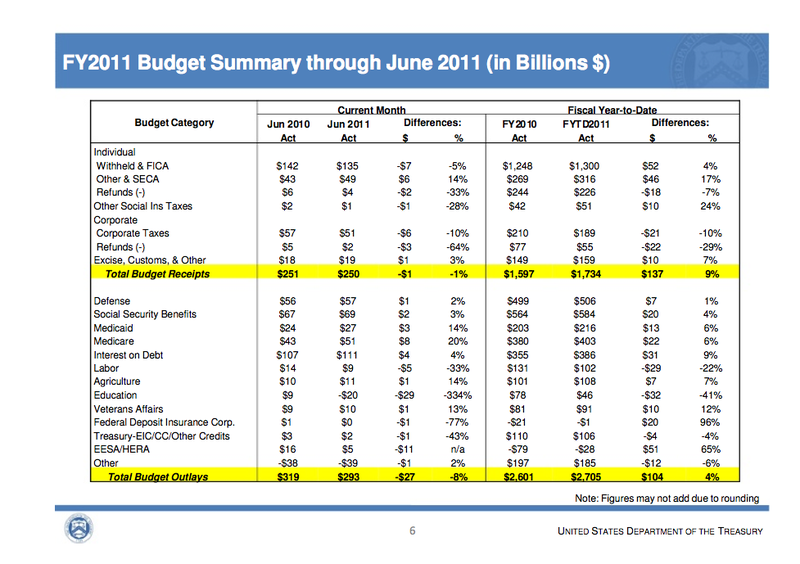 Therefore, tax revenues go down. Therefore, the debt goes up. And therefore, the projections of future debt, which are now looked at as very beneficent by bond buyers. Well, if that happens and the bond buyers back away, then you will not get to the election before major events cause turmoil. That's one and the Middle East, certain war events in the Middle East would be another problem for governments to solve. James: Disruptions to the oil supplies particularly. Victor: Exactly and therefore the deficits would get higher and oil would go way up and cause GDP to go down. James: Yeah. What we have now is we have a structural deficit. Nobody seems to be solving it. Are bond buyers really the force that they used to be? Given the fact that most of the debt is now being actually bought by the Federal Reserve, are the private market bond buyers a force? Victor: It is true that QE2, the Fed has effectively financed the Treasury's need plus. So if it stops on June 30th then it's got to depend on other bond buyers. Now if there are no other bond buyers and they are backing away, like Bill Gross did by selling is $28 billion of treasury securities, you will then also have major problems in the economy. And you won't make it to 2012 without a crisis. If you, for example, the last budget that Barack Obama put out, which was right after the CBO budget, which comes out in January, they project 3.7 per cent average debt to GDP annually for the next 10 years. Now, bond buyers wouldn't think that that's horrible. It's not like it is now, 10, 11 per cent. If that projection gets lifted from, say, 3.7 to 8, well then there will be no bond buyers logically speaking because why would you be buying into what is going to be a major increase in the cumulative debt. So those are the things that I think are subtle here. Do we go into a double dip? Do we have outside forces that cause the double dip whether we care about it or not? We have no control. James: But it looks like we are going into a double dip now, don't you...? Victor: It does. It does. 1.8 per cent GDP with all the stimulus from the Fed and QE2, printing, effectively buying $900 billion worth of debt with the rollover. James: Yeah. It's like they put the foot on the pedal and they flooded the engine and the engine just isn't turning over. James: It looks like the double dip is all but certain. I think this is what John Williams of ShadowStats.com is also suggesting. Victor: Right. Well, he is a great analyst of the real numbers. Yeah. Double dip looks highly likely. And just to put a reason on it, the Obama Administration is doing everything it can to cause uncertainty to business people to start businesses and put capital up and take risk. There's very little of it, I should say. So the fact is that with this uncertainty over tax increases, the healthcare issue is still up in the air, what the budget deficit is going to be, the budget is going to be, if you will. All of these things make people hesitant. If you had $100 million in the bank, maybe you do. Victor: If you had that though, why would you risk when you don't really know what's going on. See, those are the people that really – they are the ones that make the decisions. But their decisions of growing businesses and starting business – but they're going to be influenced by what they think the future is going to be. They're not going to risk their money unless they think there's a pretty sure reward. James: Yeah. That's actually contributing to the weak economy. It just isn't the job growth that one would normally expect after coming through what we came through. Victor: Exactly, especially with 30 months of zero interest rates. You have to go back prewar to find that kind of scenario. James: Which is actually quite interesting because imagine what the federal deficit and debt would be now if we had normal interest rates. We're at $14 trillion debt, one per cent on that is $140 billion additional deficit that the US government would be incurring. So five per cent would be, let's say, a normal historical interest rate on government paper. T-bills now are half a percent if that. Victor: No, no, T-Bills are three basis points. Victor: As of this morning. James: Yeah. So it's going to be a big, big impact in terms of the debt. James: So higher interest rates are actually a problem as well because what that will do is cause more federal spending to pay off the interest expense which will cause more federal borrowing. James: So they're really between a rock and a hard place. Victor: In this case the higher interest rates – again, I've done this study. So I might as well give you the free statistics of my research. In 2020, in 10 years, right now the cumulative interest payments as a part of the total debt is eight per cent. If you use the CBO numbers, which they get from the Obama Administration, in 10 years it will be 21.5 per cent, using their numbers. Now, where is the difference going to come from and that assumes the Bush tax cuts go away. So they assume that taxes and total tax collections are going to be in the 20.5 per cent range for the whole decade. Therefore, with that it's still going to be 20.5 per cent. Victor: It is. It's 21.5 per cent. In other words, you can't find the difference. So there is really - if you don't change in a major way this is unsustainable, it doesn't work. 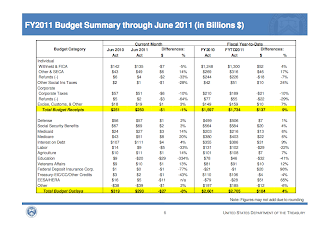 James: So even the Republican's proposed budget really is not enough to bring about the change that's necessary? Victor: Not if you assume a 4.7 per cent average interest rate. James: Yeah. Because they also, I think, have some pretty rosy projections in terms of what they're talking about for economic growth which raises some questions whether those are realistic as well. They're now proposing to bring the deficit down until; I think it's 2027 if I'm not mistaken. Victor: It will never get there. James: Something will happen beforehand? Victor: Under these conditions you're not going to get past 10 years because like I say, where are you going to get the difference between eight and, let's call it, 22, where are you going to get the 12 per cent. That assumes the end of the Bush tax cuts, which is not a sure thing. James: Yeah. What is going to be the tipping point, do you think, that really brings all of this to a head? Obviously people all around the world are doing their numbers and they're [Vic clears throat and obscures speech] saying that this is not sustainable. The US is living far beyond its means. It's not addressing the issues of all of the continuous reckless spending that's going in Congress, the accumulation of debt. What do you think is going to bring it to a head? Victor: The tipping point here is psychological and it's in this respect. It comes to the bond holders, T-bill holders, bond holders and the new bond buyers. So if they believe that they're not going to get their money back, paid in similar purchasing power dollars within reason, they will sell the bonds, as Bill Gross did, or certainly wouldn't buy anymore bonds. So the tipping point is when you start to project the GDP to be lower and deficits higher, bond buyers in this case, not in the normal case would you normally buy bonds in a weak economy. In this case I think the bond holders will sell. I just came from Brazil. In 1993 Brazil suffered inflation of 2,000 per cent. By the way, that's about 28.5 per cent compounded monthly. The highest month was 83 per cent. They effectively wiped out the debt by inflation and it worked. Right now Brazil is a part of the brick. It's the B in the brick. It's an emerging country and they sell a lot of commodities so they're doing very well. But they literally wiped out their debt by increasing their money supply by 10,000 times. That's how they solved the problem. I think this is what Bernanke wants, but on a much smaller level. He's not talking those numbers, but basically that's the only way out. So if you start to go into a double dip because the economy is sluggish, bond buyers should do what Bill Gross does – is sell. What Bernanke's answer is is more QE3s and 4s. Therefore you get into an inflationary environment where bonds are certainly not desired. So that's the tipping point is when GDP starts to be projected as going down. They keep saying next year, 3, 3.5 per cent. As long as you have those kind of scenarios nobody panics. James: Putting a rosy forecast on it, they tend to think that we'll work our way through the system. But if we do get this double dip, and there's a lot of evidence to suggest that we're going well into it... Housing, for example, is turning down very rapidly again in many parts of the country. The tipping point could be reached, maybe, this summer. Victor: Well, that's a little trickier to call because, you see, you need – the way it's viewed by the world mostly is they take a consensus of economists. So you have 50 economists. Most of those economists are Keynesian, liberal economists. Therefore they're going to skew the numbers to make it look a bit more rosy than it is. Really, what you have to do is play that a little bit week to week using your own judgment because it is a difficult thing to do when a government doesn't want to tell you the honest opinions of what it's doing and they all hide these numbers. So you have to start to see this being very obvious and then also what the budget is going to wind up being, how much of the spending is going to get cut, some of it certainly will. How is it going to be effectuated? Is it going to be a lot this year or next year? Those things are a little bit subjective because we don't know what the outcomes will be of those questions. James: Yeah. Are the problems in Europe, the sovereign debt crisis – and Greece is coming back to the headlines again because it's clear that the previous bail out wasn't enough and it's not really working properly and they're in the hole again and have more problems to deal with. Are those problems in Europe actually helping the dollar in the sense that it's making people look at Europe and say that problem is bad there, maybe I should I stick with the dollar? Victor: Absolutely. There's a lot of shorts in the dollar so it's helping. 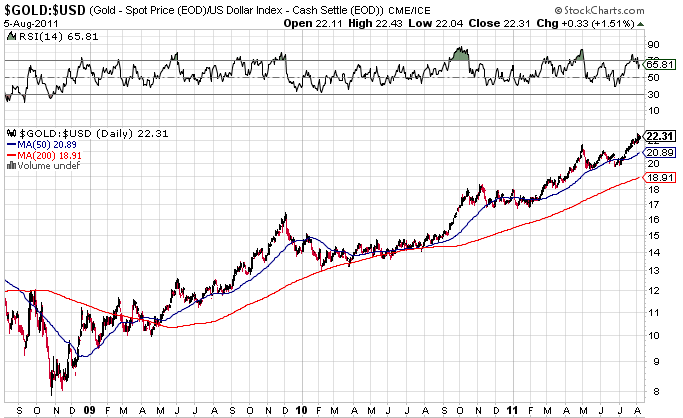 When the euro sells off, the dollar rises. That's really what saved the dollar. It's caused this commodity sell off. But the euro can't sustain itself the way it is. It's going to disappear. If you like Angela Merkel, I say this, cut her picture out and put it on your refrigerator because when the full election comes about, she's gone. The German people have got it. The people who pay taxes get it. They're not going to give their money to a higher cost country that retires earlier than they do. That game is over. So Greece is going to be either thrown out of the European Union, if I'm phrasing the concept properly, but they're going to default. James: The promise to the German people was that the ECB would be run like the Bundesbank and euro would be managed like the Deutschmark. But obviously the promises are being broken. I think the clearest example is after the Greek crisis last may and the politicians got together, the ECB announced that they're going to be buying sovereign bonds after pledging many, many times that they weren't going to do that. So it made clear that the ECB is under political control, not like the Bundesbank which really guarded its independence. Is that part of the reason, in your view, that you're saying the euro is going to have problems? Victor: Yeah. It can't bail out – the original rules... December a year and a quarter ago, the rules were that you don't bail the members out. Not only have they bailed out Greece, it's like belonging to a club you don't pay your dues, they usually throw you out of the club. In this case not only they didn't throw Greece out, they paid their other bills. They paid their car payments, their house payments. It just can't go on. Then, of course, you saw the other countries, Ireland and Portugal, and the really bigger potential would be Spain, even later than Spain, Italy. You can't keep bailing people out. So the concept of the euro works as long as people can discipline themselves to be reasonable in their spending habits. But what we have proven, and that's why there was an original gold standard in the US and not a paper standard is because politicians can't discipline themselves because they care more about their jobs than they do about their country or their people. It's two and two to me that this kind of thing happens. But the key is there are no more bailouts per se, as we've seen them and therefore, to me, the European Union, if they're smart, will lose a few members and they'll stay intact. 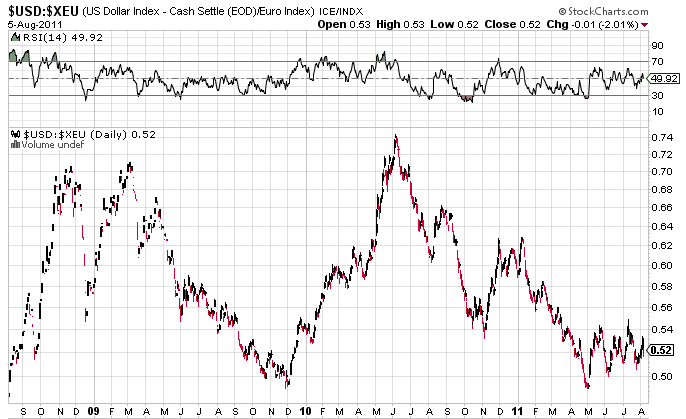 But if it starts to come apart at the seams, then it will really be a disaster for the euro and Germany will be a great place to be after the fact, but it's not going to survive as we know it. James: Yeah. What's more likely, that they'll kick out Greece or Germany is going to withdraw itself voluntarily and reestablish the Deutschmark? Victor: I believe Greece will default before that happens. James: They're going to try to save the Euro at all cost regardless of the politic winds in Germany at this moment in time. Victor: Correct. That's Angela Merkel's mindset, I think, and so is Sarkozy's. James: Yeah. OK. Just turning back to the markets again. We talked about gold. We talked about interest rates. What about silver? Victor: Well, silver, let me just put this into context. 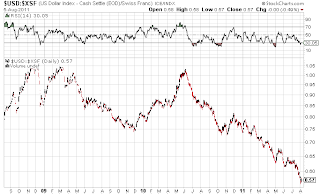 If you ask yourself what the volatility was of silver using standard deviation for the last ten years, it's 32 per cent. It's more than double the S&P. It's far more than the NASDAQ. It is the most volatile object on the face of the earth. Also, I do this for a living, if you try to build an algorithm that makes money trading silver. We tested, I'm not exaggerating, 218 of them with various trend-following rules, different weights, short term, intermediate term. The only ones that make money are long term. So more than a year with a simple weighting like one, because they're fundamentally driven. So if you try to do something sophisticated, which is what I attempt to do all the time and find these little trading rules, you don't make money in 218 different variations. None of them make money over the longer run. The only one that makes money over the longer run is long term. What it chose is gold and silver, in this case, are long term, fundamentally driven objects. You've got to think long term. Now, with that said, the volatility in the last couple of weeks has probably risen to about 60 from 30. Now, it started with margin. Why was margin raised? It was logical, by the way, I agree with the comments. You start off, it doubled in three months. James: Yeah. The price had risen so much. Victor: So when it was 25, the contracts, the trader, $125,000, it goes to 50 now it's $250,000. If your margin is $11,000 at 25 it's got to be higher, over $20,000, at 50. It's normal that Clearing Corp. does this to protect the integrity of the members who guarantee the Clearing Corp. So there's nothing wrong about that, but there's a lot of leverage in silver and a lot of traders and it went up nine, ten days in a row. So it sells off and you get a correction. Normal corrections, by the way, are measured from the move that takes place to the peak of the new move. Say 25-50 is $25. What you want to measure to know if you're still in an uptrend is the percentage correction of that move. That would be the normal - you've heard this a million times or read books, one-third to two-thirds of the previous advance. So we got two-thirds. James: Well, actually, I would probably go back to $17 or $18 last summer and take that as the base. 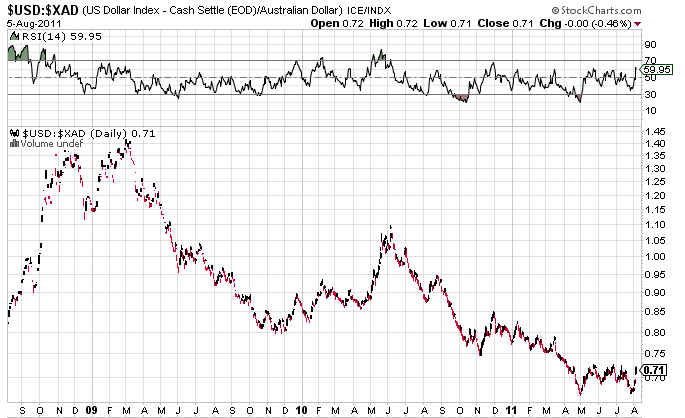 Let's say $17 to $49, divide that by two, you get $16, you get $33, your 50 per cent retracement of the move. Victor: You could look at it that way too. Victor: It's not unusual. It's normal. Victor: You can utilize that measure as well. But the key is when it went up big it's not correcting and it's still in the bull market. That's the background of it. The fundamentals of it is that – and again, I've done some research – there's supposedly 65 per cent of the mining of silver is used for industrial purposes: flat screen TVs, film, you name it, all the various things that silver is used for. So 35 per cent of it is investment. If you mine 100 ounces of silver, 35 ounces get purchased by people like you and I and we hold it as money. Now, in gold's case it's 90 per cent. 90 per cent of gold mined, you know these numbers far better than me, but approximately 10 per cent is used for industrial purposes, 90 per cent is saved. There's 3.3 trillion ounces of gold. By the way, correct me because you know this, as I say, better than me. Victor: If you figure that that's of investment, well there's under 60 million ounces of silver versus 3.3 trillion in gold. 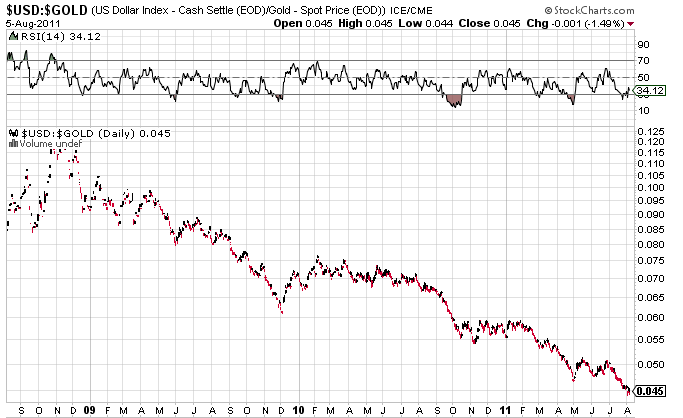 There's very little silver relative to gold. Although it's volatile because it is basically traded aggressively because it's a low-priced object versus gold and the leverage is immense. So it moves around a lot. 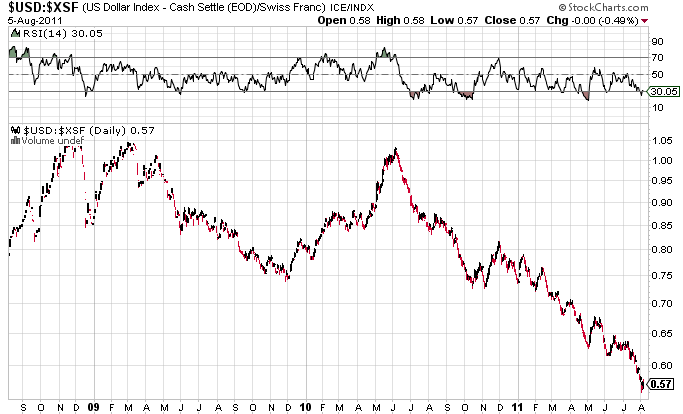 But still, the fundamentals for silver are no different than gold. They're very positive and there's just not enough silver in the world for the demand. Now, some comes from scrap and recycling and India was a seller of silver, for example, for the last five years and now they're a buyer. They're supposed to buy 1,000 kilogram tons of silver. So silver is in a major uptrend. It's basically no different than gold except that it's used more for industrial purposes. So it's actually better than gold in theory. James: ...economic calculation. Yeah. But gold, you can always use it for decoration, too, at the end of the day as many Indian women do. They save their money by putting it into a necklace. James: Any words that you'd like to use to wrap up this discussion? This video is going to be viewed all around the world by all types of people, average Joe as well as some sophisticated traders. What would you recommend going forward...? Victor: Look, the main key thing in making money in the markets is to have a theme and if that theme is fundamentally driven, you have to have a reason for it, and you're making money from the theme other than one week or two week small, minor corrections... Mostly, by the way, to pause here. TV, they don't use percentages, they use, "Oh, gold sold off $100 this week." Well, they sold at four percent. They don't use normal percentages. So the key is to have this theme and to stay within the theme. 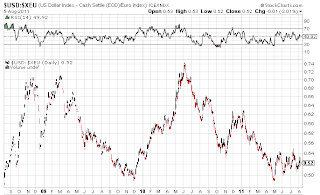 Now, as long as you see governments printing the basing, borrowing and keep interest rates below zero, real interest rates are below zero, in effect they're stealing from savers. Well, you've got to be long, the precious metals. 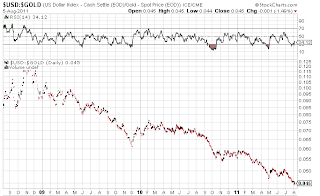 You should have other commodities as diversification too. James: So basically tangible assets are the key for going forward from here. James: Trader Vic, Victor Sperandeo, thank you very much. It's been a real pleasure.